Jabsco water pump impeller with o-ring. 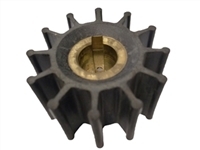 Kit includes new impeller for the Mike Kuhl River Rat water pump. Kit includes neoprene impeller and O-ring seals for the Magnaflow 3/4" Water Pump. Neoprene impeller and o-ring seals for the Magnaflow 1" water pump.